I regretfully bring you bad news. Sensei Hidetaka Nishiyama passed away about a month ago. I only found out very recently. 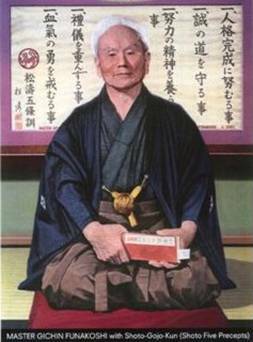 Sensei was one of the original ambassadors sent out of Japan by Sensei Gichin Funakoshi to carry traditional Shotokan karate to the world. He came to Los Angeles where he chose to live out his life. When Sensei Nakayama died several years ago, Sensei Nishiyama was the obvious choice to lead the Japan Karate Association (JKA) which he had been a co-founder. He turned down this honor due to his love for living in the United States. Sensei later founded the International Traditional Karate Federation (ITKF). Our school is affiliated with both organizations. Sensei was the ALL JAPAN world champion for several years in his younger days. Later in life he was awarded Judan (10th Dan) which is the highest rank in our organization, and even chosen by the Japanese government as a “living national treasure” for his efforts in bringing Karate and good will to the world. I was also honored to have trained and tested under Sensei, as well as becoming personally acquainted with him. Being in his presence was truly being in the presence of GREATNESS. Those times are among the highlights of my life. You, as Karate-ka in traditional Shotokan, carry the same heritage. Your responsibility is to train and practice your Karate in the same spirit that Sensei did. In this way, Nishiyama will always be with us. My responsibility is to teach you traditional Shotokan karate to the best of my ability with no changes or modifications to that system. Let us all carry the spirit of traditional Shotokan karate that has been given to us by Sensei’s Matsumura, Itosu, Funakoshi, Nakayama, and Nishiyama. I will miss my Sensei. Master Funakoshi is most responsible for the systemization of Karate as we know it today. Born in Shuri, Okinawa in 1869 began study at the age of 11 of Okinawan martial arts (Okinawa-te, Okinawa hands) under the top two masters of the art at the time. And in time became master of karate in his own right. He is credited with being the first man to introduce Karate to Japan proper, when he gave exhibitions in 1917 and again in 1922 at physical education expositions sponsored by the Ministry of Education. During this same time in Japan Jujitsu and Kendo were widely practiced. Karate soon took over many elements from both of these and the basis was laid for modern Japanese- Style Karate. In 1948 Japan Karate Associations was organized and Master Funakoshi as Chief Instructor. The name Shotokan was derived from Master Funakoshi's Pseudonym (Shoto) he used while writing poetry. The name Shoto "waving pine-tree" came from the tall pine trees in the area that would often sway in the wind and Kan (school). *majority of information used here is paraphrased from "Karate The Art of Empty Hand Fighting", Hidetaka Nishiyama and Richard C. Brown , Published 1960. ***Japanese-American karate master, author, administrator and pioneer. Born in Tokyo in 1928, Hidetaka Nishiyama began his karate training in 1943 under Gichin Funakoshi at the Shoto- kan. Two years later, while enrolled at Takushoku University, he became a member of the university's karate team, for which in 1949 he was named captain. He was a co-founder of the All Japan Collegiate Karate Federation and was elected its first chairman. Nishiyama received a Master of Arts degree in economics from Takushoku University in 1951. That same year, he was a co-founder of the Japan Karate Association (JKA) and was elected to the JKA board of Directors. In 1952, he was selected as a member of the martial arts combat instruction staff for the Strategic Air Command (SAC) Combat Training Program. SAC personnel received training in judo, aikido, and karate at the Kodokan. The other karate instructors for this program included Gichin Funakoshi, Masatoshi Nakayama, and lsao Obata. In 1953, SAC invited Nishiyama as part of a 10-member Budo Mission from Japan. The team visited SAC bases in the U.S. for three months giving instruction in karate, judo, and aikido. Karate: The Art of Empty-Hand Fighting co-written with Nishiyama and published in 1960, is even today considered the definitive text book on the subject. In its 70th printing, (2, 000 copies per printing) it is believed to be the best selling karate text book in history. In July 1961, SAC karate students and JKA members residing in the United States invited Nishyama to visit America. Later that year, he organized the All American Karate Federation (AAKF) as a nationally based amateur karate organization. In November of the same year, Nishiyama organized under the control of the AAKF the first National Karate Championship in Los Angeles, California where he also established his dojo. Since then Nishiyama has been a major force in the propagation of the Shotokan style of karate in the U.S. and abroad. In 1965, Nishiyama organized a committee with the cooperation of the major Japanese karate styles that led to the first United States vs. Japan Goodwill Karate Tournament. Because of the participation of the All Japan Collegiate Karate Team, this event became the first truly international karate competition. In 1968, Nishiyama organized the first World Invitational Karate Tournament held at the Los Angeles Sports Arena in conjunction with the Olympic Commemorative Tournament hosted by the Mexico Karate Federation in Mexico City. A conference which took place during the tournament culminated in an agreement to form an international karate organization and to hold its first World Championship in Tokyo. In 1970, during a reorganization of the AAKF as the traditional karate governing body, the JKA Karate group separated and became the JKA-US, part of the AAKF. Nishiyama continued as Chairman of the JKA-US and also as Chairman of the AAKF. In April of that same year, the AAKF became a member of the U.S. Olympic Committee. In 1973, Nishiyama co-founded the Pan American Karate Union (PAKU) and was elected its First Executive Director. The first PAKU Championship was staged in Rio de Janeiro. Based on a 1968 agreement formed at a Mexico City conference, tournaments were held in Tokyo (1970) and Paris (1973).These World Championships resulted in disagreements caused by the lack of formal international organization. An international meeting later followed in New York City resulting in the formation of the International Amateur Karate Federation (IAKF) with Nishiyama elected as its Executive Director. The first IAKF World Championship was held in Los Angeles in 1975. He oversaw the formation of the Mediterranean Kara te Championship Committee and Bolivian Karate Federation in 1976. Also that year, acting on behalf of the IAKF, he submitted an application to the International Olympic Committee seeking Olympic recognition for Karate. Nishiyama then supported the formation in 1977 of the Central America/Caribbean Karate Confederation and the Asia/Oceania Amateur Karate Federation. In 1979, in accordance with U.S. Public Law regulating national amateur sports governing bodies, the All American Karate Federation was succeeded by the American Amateur Karate Federation, a public benefit, non-profit corporation. Nishiyama was elected its first President. In 1981, he also lent support to the formation of the South American Karate Confederation and the North American Karate Confederation. In 1985, the IAKF changed its name to the International Traditional Karate Federation (ITKF) because the word "karate" had become a generic term applied to a variety of kicking/punching sports. The ITKF, under Nishivama's direction, wanted to make clear it was the governing body of traditional karate. In 1987, the IOC officially confirmed that the ITKF was the governing body for traditional karate. Nishiyama's reputation has spread foremost because of his superior technical expertise and his disciplined instruction. Among his former students are All Japan Karate Champions Hiroshi Shirai and Takeshi Oishi. He trained a host of international and national instructors, national champions and celebrities. Master Nishiyama passed away November 7th 2008, and will be greatly missed. Master of Traditional Karate, President of the American Amateur Karate Federation (AAKF) and Chairman of the International Traditional Karate Federation (ITKF), was honored by the U.S. Senate on October 10, 1999 by flying the flag of the United States over the U.S. Capitol in his name. On November 3, 2000, Master Hidetaka Nishiyama, Chairman of the International Traditional Karate Federation (ITKF) and President of the American Amateur Karate Federation (AAKF), was recommended by the Japanese government for his worldwide promotion of Japanese culture as a Master Instructor of Traditional Karate. His half century of meritorious contributions were then honored personally by the Emperor of Japan in a special ceremony conducted at the Imperial Palace in Tokyo; where, the "Order of the Sacred Treasure, Gold Rays with Rosette" was awarded to him. It was the first time in the history of Japanese national awards that such recognition was granted to Traditional Karate, and reflects Master Nishiyama's lifelong contributions to the development of the superior physical, mental and spiritual aspects of Traditional Karate. Furthermore, Master Nishiyama was one of only eleven recipients from outside of Japan that were honored at this year's ceremonies for their contributions to Japanese culture. ISKA recognized Master Hidetaka Nishiyama as Judan, tenth degree black belt, at a formal ceremony, November 1, 2003. On November 1, 2003, Master Vincent Cruz and the Yudansha of the International San Ten Karate Association formally recognized Master Hidetaka Nishiyama as Judan, the tenth and highest rank in traditional karate. Master Nishiyama at first tried to turn aside the honor, but was moved by the heartfelt affection of the ISKA leadership. The framed certificate celebrated his life-long devotion to traditional karate, his research, and his continued search for the truth. Sensei Jim Baize began his martial arts experience in the Yokohama Karate and Judo Club in Yokohama, Japan at the age of 9 (1958-59). After a long lay off period, he continued his training under Sensei Albert Church in <?xml:namespace prefix = st1 ns = "urn:schemas-microsoft-com:office:smarttags" />Ft. Campbell, Kentucky in a Shotokan/Taekwando system. He was promoted to Shodan in Shotokan karate in 1968. He continued promotions in the Dan ranks in this system and under Sensei Church as follows: Nidan- 1969; Sandan- 1971; Yondan- 1975; and Godan- 1981. Sensei Baize established the United Shotokan Karate Federation (USKF) based in Memphis, Tennessee. At a seminar in Little Rock, Arkansas, he met Sensei Hidetaka Nishiyama in 1984. The following year, Sensei Baize began to train exclusively in Traditional Shotokan karate under Sensei Nishiyama. There he proceeded in the Dan ranks as follows: Shodan- 1988; Nidan- 1989; Sandan- 1991; and Yondan- 1993. All of Sensei Baizes rank from 1988 on has been under the Japan Karate Association (JKA) guidelines. His certificates are all from Sensei Nishiyama through the International Traditional Karate Federation (ITKF). Throughout the years Sensei Baize has had the honor of training with such karate greats as Kawasowe, Shirai, Enoeda, Mikami, Shoji, Katsumata, and of course Sensei Nishiyama. Sensei Baize still resides in the Memphis, Tennessee area and continues his affiliation with the ITKF. He also continues to be the chief instructor in his own organization, the USKF.